Karl Corts- Lead Guitar, Vocals. songs "through an empty paper towel roll" just to get "that freaky sound, man!" Club in St. Paul, and several live acoustic performances on radio. twenty year veteran bassist Rick Maxwell. Their latest offering, "Take Flight,"
pop riffs, booty-bumpin' bottom ends, sublime harmonies, and witty wordplay. imagine you're sitting alone in the warm sun on a rocker outside a rustic barn in the middle of nowhere. Hear those fuzzy guitars, down-to-earth vocals, and soul-soothing grooves? 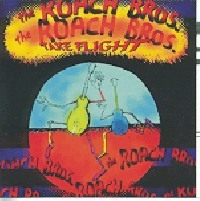 Ahhh....that's The Roach Brothers, baby. 1986: The Atomic Bums, "Zero Degrees" Vinyl only, out of print. Mile 9 Records. 1996: Jack Logan & Liquor Cabinet: "Mood Elevator" Medium Cool Records. 1996: "The Today Show" on ABC-TV. 1997-Present: Radio K, Minneapolis, Mn. KUMM, Morris, Mn, KSMM, Chaska, Mn.